Whether you’re on your first date or your 250th, a good date movie almost always consists of a cute lead actor/actress, a great storyline, action, adventure and a few laughs thrown in for good measure. So, when hubby and I went to see Thor Ragnarok, I was thrilled because it delivered on all fronts! In this instalment of the franchise, Thor (played to perfection by the fabulous Chris Hemsworth) finds out his family – and family history- holds many secrets, one of which is the fact that he has an older sister. Hela, the goddess of death (played by Cate Blanchett), has decided the time is right to stake her claim to the throne of Asgard. Predictably, Thor isn’t having any of it… but he hits a snag when he realizes his sister is more powerful than he ever imagined. Down, but not out, Thor fights his way back home, to protect Asgard. While on his journey, he comes across an unlikely adversary (the Hulk, played by Mark Ruffalo) and enlists the help of some other formidable characters in his quest to set things right. With a fast-paced and interesting storyline, and an amazing cast that also includes Tom Hiddleston (Loki), Idris Elba (Heimdall), Benedict Cumberbatch (Dr. 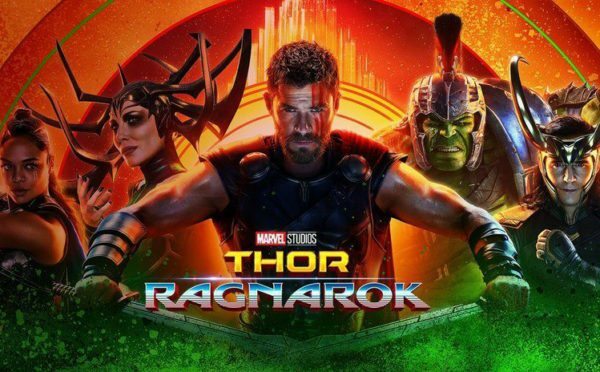 Strange) and Anthony Hopkins (Odin), Thor Ragnarok is chock full of acting talent, making this a movie worth seeing. I was surprised by the amount of dry humour in this movie, and loved how it played nicely against the action elements of the movie. It’s a wonderful thrill ride that keeps you guessing right up until the very end. If you haven’t already seen Thor Ragnarok, it’s time to plan a date with your significant other or set up a girls night out with your besties! Tip: remember to stay through to the very end of the credits, so you don’t miss the post-credits scenes; they’re great!